A conspiracy against the public – that’s what the pioneer economist Adam Smith called the process whereby suppliers get together and collude. 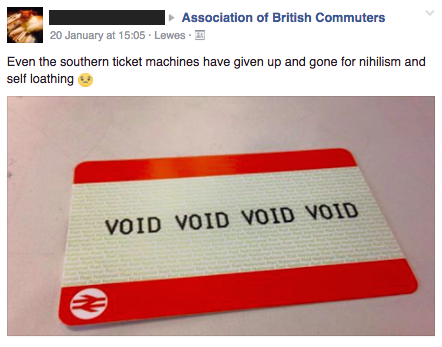 I thought of that last week when I set off from Shoreham-by-Sea, my local station, to find that Southern Rail had been rushing out the new style ticket machines through the franchise area and cutting corners, so that – that morning – nobody could access their pre-booked tickets. Perhaps this should have been no surprise given the crisis in the quality of their service over the last year – the roots of which are set out in my short book Cancelled! What is strange is just how much the Department of Transport has ignored the needs of passengers in Sussex and surroundings – not just disabled passengers, but especially them. It is ample demonstration that Adam Smith was right. When the government instructed Southern to settle the strike with drivers the day after my #passenger strike in January, I learned some important lessons. The main one is that, even operating monopoly services, the Department can’t resist the views of middle England when they are expressed powerfully. So it may be that the general election provides an opportunity to tackle the Southern scandal once and for all. 1. Will they commit to publishing the Chris Gibb report on a specified date? 2. Will they give back the right to travel by train for disabled passengers? 3. Will they commit to ending the Southern franchise and handing it over to a new mutual provider, owned and operated by representatives of passengers? Beware as you do so of getting involved in discussions about strikes – which are not, after all, anything to do with the current failure to provide more than foreshortened trains on many routes. Nor should you get drawn on rail privatisation. My own view is that, given that Labour and Conservative parties appear to be committed to running Southern directly by the Department of Transport, we probably need a new approach. The privatisation debate will put the argument back onto the old, familiar and largely pointless tramlines. General elections are not scheduled or timetabled very often. Anyone who cares about the rail services in south east England needs to make sure that, this time, we don’t miss the train.